Not Sure of Magazine or exact date this came from. Assuming 1984 just after the cookery school opened and we were still running the farmshop. The OCR conversion is very impressive, but sometimes Allen is recognised as Alien which makes it amusing. I hope I have fixed them all. ALL over England, and, indeed, on the continent, particularly in France, lots of farm shops are selling top-class fresh farm produce. It is one way of making a few shil­lings to supplement the family income, but, in addition, it is a way of selling fruit and vegetables, which although may be of good quality, are just not acceptable at market. Farm shops can be run by indivi­duals or by a group scheme and are something farmers' wives can operate' successfully on their own. .
At Shanagarry, Co. Cork, Darina Allen is running one such shop in which she sells seasonal fruit and vegetables picked daily from her garden and greenhouses; home-made cakes and biscuits with tantalising names such as "Yum Yums" and "Lana's Barmbrack"; farm house cheeses and, of course, the celebrated Ballymaloe brown bread, which is baked each morning at Ballymaloe House — the hotel which Darina's mother-in-law, Myrtle Allen, has been running very successfully for some years. Originally from Cullohill, Co. Laois, and trained in hotel manage­ment, Darina went to Ballymaloe to learn how to cook. As she admits, "I learned how to cook and married the boss's son!" When Darina first joined her husband, Tim, at Shanagarry, the Aliens were growing tomatoes and mushrooms under three acres of glasshouses. With the increase in the price of oil, the cost of keeping these glasshouses became uneconomical and they found, not surprisingly, that they were losing money on the venture. "So we took down the old glass­houses and built a new and smaller one and started to diversify our crops", Darina explained. Indeed, now the Allens grow about 20 different crops, including such delicacies as ogen melons, arti­chokes, sweet corn, aubergines and courgettes, as well as old favourites like tomatoes, cucumber and peppers. Next year they plan to grow grapes and asparagus, increasing their range of fruit and vegetables even further. The whole farm at Shanagarry spans about 100 acres, 10 of which are under apples and about 60 to 70 are under soft fruits such as straw­berries, raspberries, blackberries, blackcurrants, redcurrants, logan­berries and gooseberries, which the Aliens now operate under a "pick your own" scheme. The remainder is taken up by the glasshouse and vegetable garden. 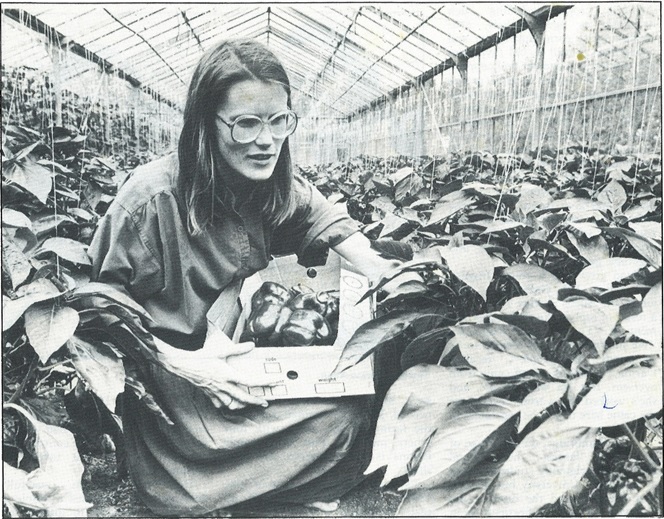 Head grower is a young English girl called Jill Gairdener, who joined the Aliens in May 19th '82 as a result of replying to their advertise­ment in "The Grower" magazine. "We interviewed what seemed to be thousands of people", recalled Darina, "many of whom came from overseas. But Jill was the one, and she's worked like a trojan ever since she came here to get the vegetables in order". From Cambridge, on the fringe of England's largest horticultural region,. Jill originally studied politics at Lancaster University but decided that she preferred the outdoor life and went on to study horticulture in Wales. Eight years working with a small vegetable enterprise in Sligo gave her all the experience she needed. Jill lives in a small cottage on the farm and she works with four others, including Tim Allen, while Darina is left to oversee the farm shop. "We first opened the shop in June 1982", continued Darina. "It all really developed from selling apples directly from the farm. We thought we could expand on that kind of thing and both Tim and I went to England to get an idea of how they went about it there. We had this old farm building which we converted to a shop and it's just taken off. Business is booming". Darina's shop is tastefully decorated. She has used a couple of refurbished dressers to display her jams, chutneys, home-made muesli and, of course, the inevitable Ballymaloe cook book written by Mrytle Allen. The shop is open seven days a week — Monday to Saturday from 11 a.m. to 7 p.m. and on Sunday from 10.30 to 6 p.m., although Darina admits that she is often open earlier or later than the times stated. This year she opened the farm shop from Whit (early June) and will stay open until the end of November. A great part of her trade comes from the seaside caravan site near by, which means she has a ready-made market. Part of Darina and Tim's market¬ing strategy is attributed to the fact that "we give away vegetables which people wouldn't normally consume at home. And you'd be astonished at the amount of people at the end of the summer who are looking for recipes for ratatouille (a vegetable stew with a Continental flavour)". The Allens charge a price halfway between wholesale and retail costs, and on a recent visit I found some delicious "curly" cucumbers (not acceptable for market) for 15p each. A lot of the vegetables, of course, are consumed by Ballymaloe House but such is business from the farm shop that Darina anticipates being able to run her house with the money she makes from it. Darina Allen is a worker and a woman who combines her role as housewife and mother (the Allens have four young children) with that of her role as a business woman. And it is very few farmers today who make full use of their land and buildings and make money from it.